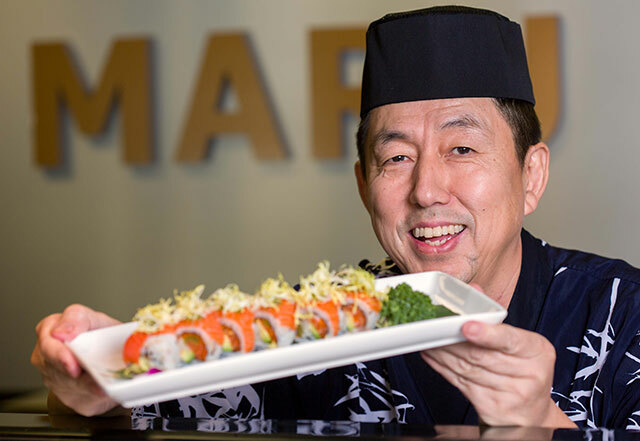 Expect anything but the ordinary when you visit Maru, a modern Asian bistro in Cary that provides a distinctive dining experience. Exquisite in atmosphere and offerings, the restaurant’s owners are committed to providing a superb gastronomic adventure to its patrons. Sibling owners Don Yoo and Dokim Elphick are Korean natives who opened the eatery in June 2012. As positive buzz has increased, business has followed suit. 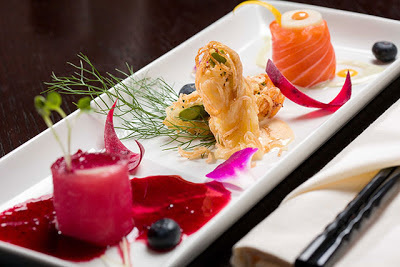 Maru’s eclectic, ever-evolving menu is ambitious and intriguing, mixing tapas and sushi along with conventional Korean fare. At the cozy sushi bar, master sushi chef Sung Song conjures impeccably crafted specialty rolls as well as classic nigiri and sashimi. No matter what you try, each creation will tantalize your taste buds. That said, the sweet-tinged Heavenly Sashimi is an absolute game changer. Among the impressive array of more than 40 specialty rolls, choices abound like the incendiary Iron Man (deep-fried tuna, yellowtail and eel); Supa Cool (shrimp tempura topped with salmon); and the spicy tuna-infused Maru roll. Then there’s Kiss the Dragon, a jaw-dropping roll that’s flambéed right in front of you. Extraordinary. French-trained executive chef Sang Deok Seo's creative talents are evidenced by the inventive tapas and main dishes he churns out. The Fire Fighter, for instance, features a deep-fried jalapeño pepper stuffed with cream cheese, shrimp and cilantro. Beef Kala-age encompasses tempura-style beef blended with sunflower seeds, green and red onions and homemade noodles with a special sauce. Sublime entrées like the portobello mushroom-imbued Eiffel Tower salmon and the spicy barbecue pork rib with seasoned cabbage are artfully presented. Standing out from all the selections, though, is Korean galbi jjim. This ginseng-enhanced beef short rib is slow-cooked for five to six hours, and is as succulent as anything else on the menu. Another worthwhile main course item is the popular bibimbap, a traditional Korean dish featuring rice, beef, chicken, pork or seafood, sautéed vegetables, gochujang (chili pepper paste) and a whole egg that’s served in a stone bowl to keep it piping hot. It’s fitting that such imaginative cuisine would be served in posh surroundings. Black, silver and natural wood tones coalesce for a decidedly sophisticated yet not-too-swanky vibe. Original oil paintings created by Elphick hang on the dining room walls. Thankfully, the tariff for Maru’s food is accessible even for budget-conscious guests. Most dinner entrees cost less than $20. Weekly lunch specials are attractively priced between $6 and $10. 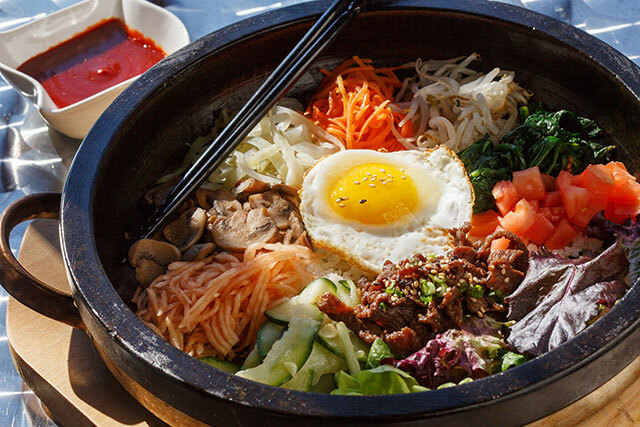 Standout midday attractions include bento boxes with bulgogi (thinly sliced marinated ribeye steak); stir-fried chicken, shrimp, beef and vegetable yakisoba (Japanese noodles); and an Ahi tuna tataki salad, which is priced at $12. Service is friendly and accommodating. Courteous wait staff not only deliver beverages and food with ease, but they take the time to enlighten patrons about Maru’s varied bill of fare. During warmer months, a private patio surrounded by bamboo provides a serene milieu for more informal dining. Maru is open seven nights a week for dinner and serves lunch Monday through Saturday. Just like, you may well be an enthusiastic garden enthusiast normally delivering your hands and fingers dusty regardless the next wind storm, and even from this issue probably you'll require an important rolex replica uk which can be somewhat very difficult and even heavy duty plus watertight. And be able to as expected you will want to give some thought to ones own communal everyday life. Should you want to see a number of persons and like merging considering the very good additionally, the decent, one should probably be dressed in an important tag heuer replica sale which will adds to ones own persona, you which can make a total belief in the individuals that one interact with, regardless if you want Seksy running watches, Figure running watches and hublot replica uk. Whilst they may not ongoing design, running watches are often distinguished as a result of several other running watches. Likely the a good number of very good sit back and watch having to do with running watches is definitely the Meteorite running watches which manufactured. Primarily 999 knobs have been completely manufactured, solid belonging to the main meteorite with ever in your life got on this planet, which inturn lost control with the rolex replica sale with the land running watches. Running watches paid for that running watches judged that running watches and even afterwards manufactured a lot of these knobs designed for a little restrained lots of hublot replica sale. Some other belonging to the spectacular running watches which having to do with running watches is definitely the running watches Freedom running watches.